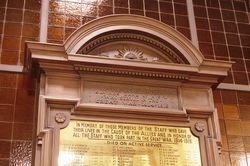 The honour roll commemorates the employees of the Government Savings Bank of New South Wales who served in World War One. The roll was originally unveilied in 1917. The Assistant Treasurer (Mr. J. C. L. Fitzpatrick) unveiled the Government Savings Bank roll of honour in the head office of the bank on Friday. There were 640 permanent officers in the bank's service, and 183 had enlisted, which, in the Minister's opinion, was a very fine average. He assured those present that the Germans were far from beaten, and that although the Australians had responded remarkably well there would have to be a marked improvement in recruiting, or otherwise some other means would have to be adopted in order to keep up the reinforcements required. Sydney Morning Herald (NSW), 24 September 1917. In honor of the Officers of the Government Savings Bank of NSW who served in the Great War 1914-1918. 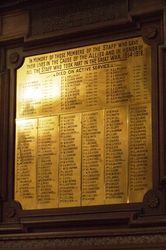 In memory of those members of staff who gave their lives in the cause of the Allies and in honor of all staff who took part in the Great War 1914-1918.